(c) Add income from all other heads-House property, Profits & gains of Business or Profession, Capital gains and Income from other Sources to arrive at the Gross Total Income as shown in the form of simple statement mentioned para 3.5. However it may be remembered that no loss under any such head is allowable by DDO other than loss under the Head "Income from House" property to the extent of Rs. 2.00 lakh. 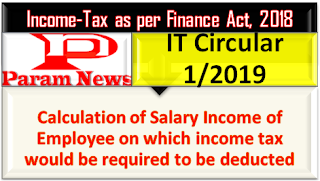 9.2 Income-tax on such income shall be calculated at the rates given in para 2.1 of this Circular keeping in view the age of the employee and subject to the provisions of sec. 206AA, as discussed in para 4.8. Rebate as per Section 87A upto Rs 2500/- to eligible persons (see para 6) may be given. Surcharge shall be calculated in cases where applicable (see para 2.2). 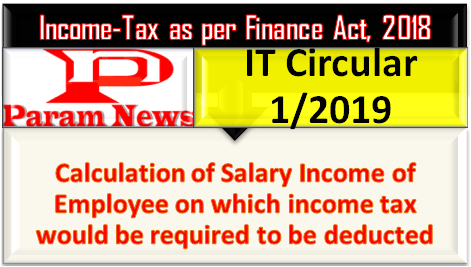 9.3 The amount of tax as increased by the surcharge if applicable so arrived at shall be increased by Health and education Cess at the rate of 4% to arrive at the total tax payable. 9.4 The amount of total tax payable as arrived at para 9.3 should be deducted every month in equal installments. Any excess or deficit arising out of any previous deduction can be adjusted by increasing or decreasing the amount of subsequent deductions during the same financial year.